I'm stalking a Monkey.....ooh! I think I've got him backed up against a Blue Brick Wall! 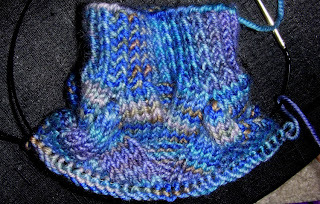 Just like everyone says, an amazingly quick knit. Started these last night during "The Office". I am really falling hard for this colorway, picked up at Rhinebeck last year. Thanks for all the sock compliments! My goal is to make a good sized dent in the current sock yarn stash before Rhinebeck so I can add on again. Not to mention the Bank Error discount at Blue Moon. This is pair #9 for 2007! No where near the caliber of those going for the 52 pair plunge, but someone has to cheer on the sidelines. We are off to Cape Cod for the weekend, which will provide plenty of opportunity to wear handknit socks and knit socks, given the forecast calls for mid-forties and 100% "chance" of rain all day today and tomorrow. Another update when we return. Maybe, dare I say, even another FO! As for the contest, keep those guesses coming! A few of you are close...but I'm not sayin' who! Hey, another post! Rockin'! That blue is beautiful, and I'm not a big fan of the blue. I think I might have to make some monkeys soon. OOoooh it is so pretty! I can't wait to try this pattern.